The earth is our source of life, it is limited and cannot be expanded, it is common to us all. open-air exhibition space, with paths of discovery and discussion to be trod thoughtfully. 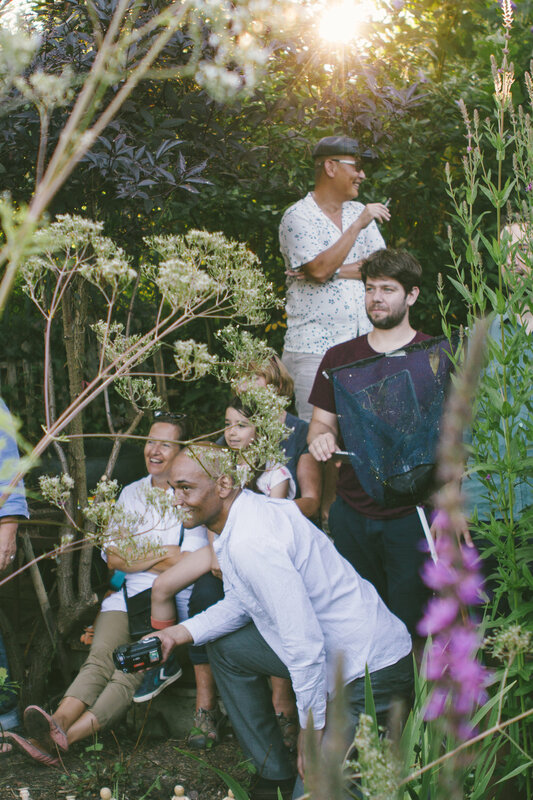 The project has engaged thirty resident plot-holders, initiating and encouraging them to collaborate with sixteen artists, whose largely site-specific installations will be encountered throughout the location. The show will explore themes from sustainability to destruction, loneliness and communality, labour and leisure, hunting, gathering and survival. Participating artists: Matt Ager, Pavel Braila, Bompas & Parr, Ben Cain, Sol Calero, Lucy Evetts, Dmitri Galitzine, Alexander Glass, Pil & Galia Kollectiv, Zoe Marden, Jonathan McCree, Andrew Mealor, Paloma Proudfoot, Hermione Spriggs and Jonathan Trayte. "We all have our roots in the earth, we feed from it and are nourished by it." The history of taking what was once common to us all has great relevance in times where our earth is consistently being divided up and fought over. No less so today than in previous centuries. Pavel Braila’s Paper Work plays on this notion. In his performance he uses traditional workers’ tools from Britain and Ireland to dig through a blank sheet of newspaper symbolic of modern media coverage, easily and frequently used to conceal the fact of the earth beneath. Braila uses labour to penetrate to our inner core and common earth, to retrieve it amidst the media blur, Malevich’s Black Square on a white background in negative form. The performance will take place on 23 July at 6pm. In Frutas En El Jardin Sol Calero also uses paper, but this time to wrap fruit, the colours of the fruit peaking through the monochrome fruit printed-paper. Calero frequently investigates and incorporates activities present in local communities into her work. She often uses fruit motives as a metaphor for Latin American life, referencing her Venezuelan origins. Here she emphasises the fruit’s packaging, part of the shipping labour so often negated and thrown away by consumers. These fruit, abundant and ripe for shipping seen in the context of the allotments where the produce grown is for the growers’ households alone. Hermione Spriggs’ Parrot Pie are made to match and mirror specialist hunter-decoys, in the hope that they’ll lure a local population of shy ring-necked parakeets further into the site with the expectation of starting a conversation. The ring-necked parakeet, classed as an invasive species, feels particularly relevant in the current climate. The work also raises questions concerning the wild versus the domestic, cages and escape, and parrots as companion animals and conversation partners through mimicry, repetition and myth. 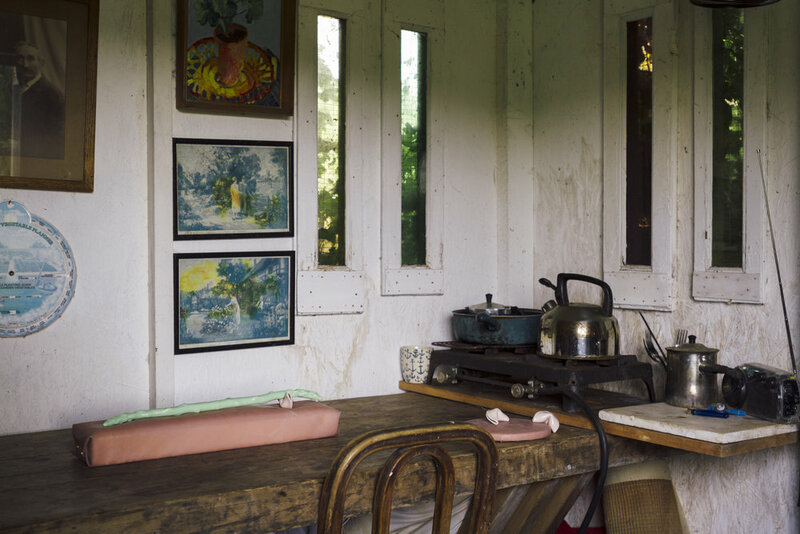 Dmitri Galitzine’s work In a Survival Situation also plays on mythology – that of a man who once managed to survive living on this allotment for seven days and nights. Myth made manifest in the form of the remnants of Galitzine’s ‘Campstead’ - a shelter constructed from foragings of materials and food on the allotment, negotiated through newly made friendships and in exchange for labour. Dmitri’s work is strongly attuned to everyday allotment practice, with its big recycling ethic, by using found and re-appropriated objects. This is clear when looking around the allotments at the scrap wood, paving, worn-out tennis balls, bottles used ingeniously to protect crops, provide shelter, make paths, filter water, and scare animals and bugs away. Matt Ager’s Centrepiece deliberately plays with found and bought objects – bamboo, used throughout the allotment, is here sprayed an artificial white – along with his pale and strangely elongated gourds which are both sickly and seductive. His table has the potential to be functional but on Mick Rand’s plot might seem redundant – deliberately domestic with a hint of cooperative vernacular, it still compliments its immediate environment by allowing the surrounding foliage to reflect in its glass surface. Paloma Proudfoot’s Stroke (Twice), Stroke (Once, again) and Fortunes are sensual and seductive – the double speared Stroker’s sickly green surface and tactility, laid out on latex wrapped cushions - suggestive of a weapon or a magical wand; becomes integral to a strange and potential allotment ritual in Dan Weldon’s beautifully organised shed. Alexander Glass’ Farm Hands (on a hot day), on Sally and Mike’s plot suggests an image of a deserted scene of pastoral labour. His addition of latex rubber, resin dipped poles and silicon towels makes us question the picturesque construction in his window frames; the reflections become at once surreal, suggestive and unsettling. Jonathan Trayte’s Monument, a large, pink, processed sausage stands, apparently incongruously in a site devoted to fresh garden produce, raising questions of artifice and manufacture against the vibrant and steadfast home-grown. Set next to Bill’s plot, which is both a traditional and highly efficient example of allotment cultivation, and which has fed the same person for over forty years, the Monument is both challenging and ironic. Andrew Mealor raises questions of waste, destruction and decay in his spraying of the dying cherry tree dug out from Mick’s plot and transplanted onto Fiona’s and the laborious grinding of an old found wheelbarrow. One, an act of heightening decay, the other of destruction, highlights discussion on the environment, displacement, sustainability and ownership. Pil & Galia Kollectiv’s Asparagus: a Horticultural Ballet shows a recording of a performance and film narrating the rise of capital in the medium of asparagus. A rigid choreography inspired by Oskar Schlemmer’s Triadic Ballet and based on Karl Marx’s Capital which dictates the movements of six performers in asparagus costumes. These references to Marxism and the organic-yet-rigid forms of a Fordist assembly line that the Asparagus dancers appropriate seem particularly pertinent in Mick’s greenhouse – amongst a community of allotments - based in land labour yet ironically located in the epicentre of the high value real estate of Highgate and Hampstead. Tools never used have no life, but here Ben Cain invests his pristine brooms In my Head I am Still a Tree with musings of their own – trapped in their role as contributing to labour whilst wishing to remain the organic tree they derived from – with pathos granted to the brushes who have clearly never been used for their assigned purpose. 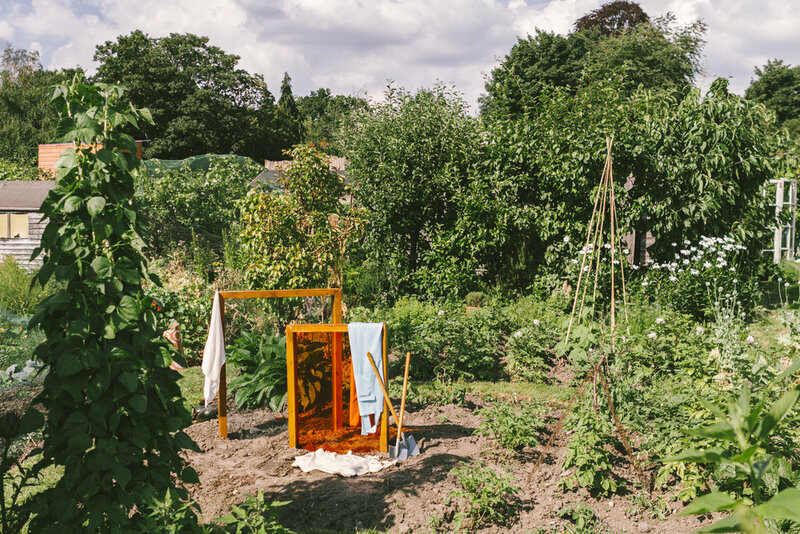 Lucy Evetts’ work concentrates on labour, the fragments of allotment life – inspired by having spent time here, befriending and interacting with plot-holders, using them as models, painting en plein air. She has focused on their hands and feet in the act of labour, acknowledging the effort used in the plots’ upkeep. The luminous colours of the canvases arranged on Margaret’s plot remind us of the glowing plants which surrounded her whilst painting. “Starweave dog days divine, invoke envelop arouse cosmic cries, liquid earth runs green goddess.” Zoe Marden’s Sighs of Sirius was initially derived from her Tarot readings of several plot-holders. In her performances she injects power, positivity and energy back in to the land worked on by Angie Birtill whose talismanic sculptures are already present on site. The ritual will take place on 23 July at 4pm and 7pm with an extended version on Saturday 6th August. Each of the art-works are made not only in response to this place but will remain subservient to and dependent on the forces of nature throughout the duration of the show, a powerful echo of the plot-holder’s reliance on the elements when working their plots. 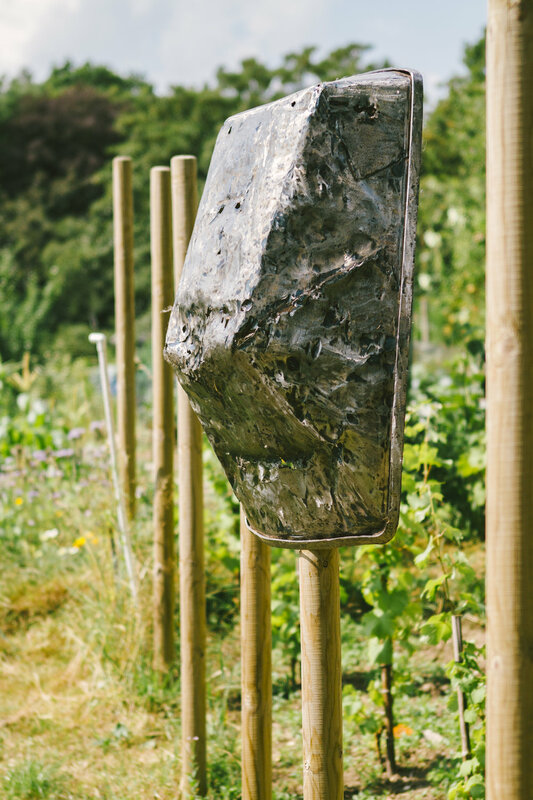 This collaborative, interactive space invites the public not simply to engage in the art-works but also with the resident plot-holders they encounter on their visit - just as the artists did, allowing visitors to the exhibition to make their own discoveries and associations and find relevance in the world of the allotment gardens.